After bringing the Persian Empire to an end, Alexander the Great tried to rule the area through one of his military commanders. But Ariarathes, a Persian aristocrat, somehow became king of the Cappadocians. Ariarthes I (332-322 BC) was a successful ruler, and he extended the borders of the Cappadocian Kingdom as far as to the Black Sea. The kingdom of Cappadocia lived in peace until the death of Alexander. The previous empire was then divided into many parts, and Cappadocia fell to Eumenes. His claims were made good in 322 BC by the regent Perdiccas, who crucified Ariarathes; but in the dissensions which brought about Eumenes's death, the son of Ariarathes recovered his inheritance and left it to a line of successors, who mostly bore the name of the founder of the dynasty. The Cappadocians, supported by Rome against Mithridates VI of Pontus, elected a native lord, Ariobarzanes, to succeed (93 BC); but in the same year Armenian troops under Tigranes the Great (Tigran) entered Cappadocia, dethroned king Ariobarzanes and crowned Gordios as the new client-king of Cappadocia, thus creating a buffer zone against the encroaching Romans. It was not until Rome had deposed the Pontic and Armenian kings that the rule of Ariobarzanes was established (63 BC). In the civil wars Cappadocia was now for Pompey, now for Caesar, now for Antony, now against him. The Ariobarzanes dynasty came to an end and a certain Archelaus reigned in its stead, by favour first of Antony and then of Octavian, and maintained tributary independence until AD 17, when the emperor Tiberius, on Archelaus' death in disgrace, reduced Cappadocia at last to a Roman province. Much later it was a region of the Byzantine Empire. Cappadocia contains several underground cities (see Kaymakli Underground City), largely used by early Christians as hiding places before they became an accepted religion. The Cappadocian Fathers of the 4th century were integral to much of early Christian philosophy. It also produced, among other people, another Patriarch of Constantinople, John of Cappadocia, who held office 517-520. For most of the Byzantine era it remained relatively undisturbed by the conflicts in the area with the Sassanid Empire, but was a vital frontier zone later against the Muslim conquests. Cappadocia formed part of the Armeniac Theme and later of the themes of Charsianon and Cappadocia. 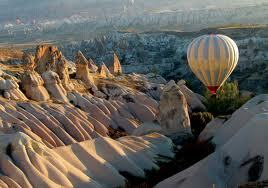 Cappadocia shared an always changing relation with the neighbouring Armenia, by that time a region of the Empire. The Arab historian Abu Al Faraj purports the following about Armenian settlers in Sivas, during the 10th century: "Sivas, in Cappadocia, was dominated by the Armenians and their numbers became so many that they became vital members of the imperial armies. These Armenians were used as watch-posts in strong fortresses, taken from the Arabs. They distinguished themselves as experienced infantry soldiers in the imperial army and were constantly fighting with outstanding courage and success by the side of the Romans in other words Byzantine". As a result of the Byzantine military campaigns, the Armenians spread into Cappadocia and eastward from Cilicia into the mountainous areas of northern Syria and Mesopotamia. This immigration was increased further after the decline of the local imperial power and the establishment of the Crusader States following the Fourth Crusade. Cappadocia became part of the Armenian Kingdom of Cilicia, a state formed in the 12th century by Armenian refugees fleeing the Seljuk invasion of Armenia and a close ally of the Crusaders. Following the Battle of Manzikert in 1071, various Turkish clans under the leadership of the Seljuks began settling in Anatolia. With the rise of Turkish power in Anatolia, Cappadocia slowly became a tributary to the Turkish states that were established to the east and to the west, and some of the population converted to Islam. By the end of the early 12th century, Anatolian Seljuks had established their sole dominance over the region. With the decline and the fall of the Konya-based Seljuks in the second half of the 13th century, they were gradually replaced by the Karaman-based Beylik of Karamanoglu, who themselves were gradually succeeded by the Ottoman Empire over the course of the 15th century. Cappadocia remained part of the Ottoman Empire for the centuries to come, and remains now part of the modern state of Turkey. A fundamental change occurred in between when a new urban center, Nevsehir, was founded in the early 18th century by a grand vizier who was a native of the locality (Nevsehirli Damat Ibrahim Pasha), to serve as regional capital, a role the city continues to assume to this day. In the meantime many former Cappadocians had shifted to a Turkish dialect (written in Greek alphabet, Karamanlica), and where the Greek language was maintained (Sille, villages near Kayseri, Pharasa town and other nearby villages), it became heavily influenced by the surrounding Turkish. This dialect of Greek is known as Cappadocian Greek. Following the 1923 population exchange between Greece and Turkey, the language is now only spoken by a handful of the former population's descendants in modern Greece.